Here’s what’s up in the world of TV for Monday, June 10. All times are Eastern. 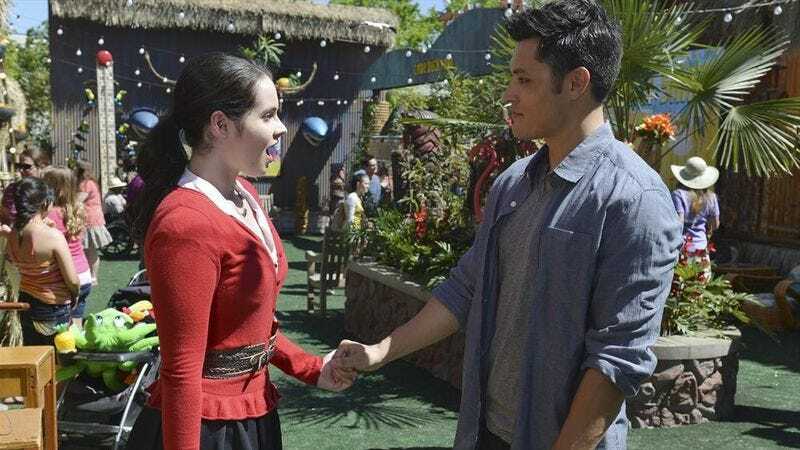 Switched At Birth (ABC Family, 8 p.m.): After its first season ended with episodes that skewed a little too far into melodrama, Switched At Birth buckled down and got back to the core relationships at its center in the first half of its second season, and it was to the show’s benefit, as it immediately resumed its course as one of TV’s best family dramas and produced a knockout episode done entirely in sign language. Now, it’s resuming its second season with Regina’s return from rehab. Carrie Raisler is sure all of this will go just swimmingly. Adventure Time (Cartoon Network, 7:30 p.m.): When Jake, Jr., gets in trouble, Jake has to reunite the old gang to pull one last job, in an episode that sounds positively delightful. Oliver Sava has been missing the Adventure Time gang over the last couple of weeks, so he hopes that job is to break into his heart. Regular Show (Cartoon Network, 8 p.m.): Mordecai plans to steal another kiss from Margaret (at least we think we remember him getting one before) during a meteor shower in an episode called “Meteor Moves.” Alasdair Wilkins hopes Bob Seger’s “Night Moves” is involved. He just really loves Bob Seger. Defiance (Syfy, 9 p.m.): This week, an astronaut who’s been in hypersleep for several decades turns up, presumably to marvel at the fact that Earth is now a crazy alien refugee camp. Rowan Kaiser hopes the episode’s title of “I Just Wasn’t Made For These Times” means Roger Sterling will drop some acid. Teen Wolf (MTV, 10 p.m.): The TV Guide summary informs us that this show has a character named Boyd, and we somehow don’t think it’s Boyd Crowder, moonlighting on this show in hopes of gaining werewolf powers that he might defeat his enemies. Phil Dyess-Nugent thinks that would be awesome. The IT Crowd (11 a.m.): What’s behind “The Red Door” of this week’s second episode’s title? Only Caroline Framke knows! Actually, that’s not true, because anyone who’s seen this episode will know, and we could probably just look it up on Wikipedia. But you know us, and you know we won’t. Batman: The Animated Series (1 p.m.): This week’s movie involves The Mystery Of The Batwoman, and we really don’t understand why Batman can’t just pick up several of the many comics that have featured the so-called Batwoman to do his investigating. That’s what Oliver Sava does, and he knows Batwoman. Scrubs (3 p.m.): This week, the gang at Sacred Heart takes on a white whale. This is probably intended metaphorically, rather than literally, but now we’re imagining a medical drama set onboard a 19th-century sailing ship. Myles McNutt could play the grizzled Canadian harpoon expert. We would watch! Grojband (Cartoon Network, 5 p.m.): Cartoon Network’s latest new series involves some kids trying to start a garage band and dealing with the usual mayhem that erupts on Cartoon Network shows, like zombies. It’s from the folks who brought you Total Drama Island, and we’re assured that’s a good thing. King & Maxwell (TNT, 10 p.m.): Have you been waiting for Jon Tenney and Rebecca Romijn to play private investigators? Well, even if you haven’t, you’re going to get to watch them do it anyway, because TNT found a book series it wants to adapt. We’ll have a review for you later in the day. The Winner Is… (NBC, 10 p.m.): NBC hopes that lightning strikes twice with another new singing reality show, this one hosted by Nick Lachey and featuring six musical acts competing for $1 million. In tonight’s first episode, the groups perform for 101 musical experts, in an inadvertent relaunch of 1 Vs. 100. Caged (TCM, 8 p.m.): “Contact with criminals in a prison transforms a young girl into an embittered woman,” says the TV Guide summary for this one, and doesn’t that just sound amazing? More films need to be about vibrant young girls being warped and twisted into embittered women by prison. He’s Just Not That Into You (E!, 8 p.m.): Or it could happen because they’re forced to have contact with this “all-star spectacular” (and we use the ironic quotation marks very loosely). Also: Shouldn’t it be “in to you” since the “in” and “to” are separate ideas and not indicating direction? Well, we think so. MLB Baseball: Red Sox at Rays (ESPN, 7 p.m.): As seems to happen all too often nowadays, the AL East is the best division in baseball, with fully four teams over .500. Two of them do battle tonight, with the first place Red Sox trying to build their lead over the fourth place Rays, who look to make up ground. Falling Skies (Sunday): Yes, the third season of Game Of Thrones concluded last night, but lots of other TV shows did things, too. Consider the alien invasion drama Falling Skies, which began its own third season with the potential of new allies for the human resistance. Les Chappell hates alien scum.